USD is staying weak while EUR is getting empowered. Today, Draghi press conference may stop EUR from further rise. The support rests at 1.23910 with resistance at 1.24620 which both lines are above the weekly pivot point at 1.22340. The EMA of 10 is moving with bullish bias in the ascendant channel and it is above the EMA of 200 and the EMA of 100. The RSI is moving in overbought area, the Stochastic is moving in high ranges and the MACD line is above the signal line in the positive territory. The ADX is showing buy signal. 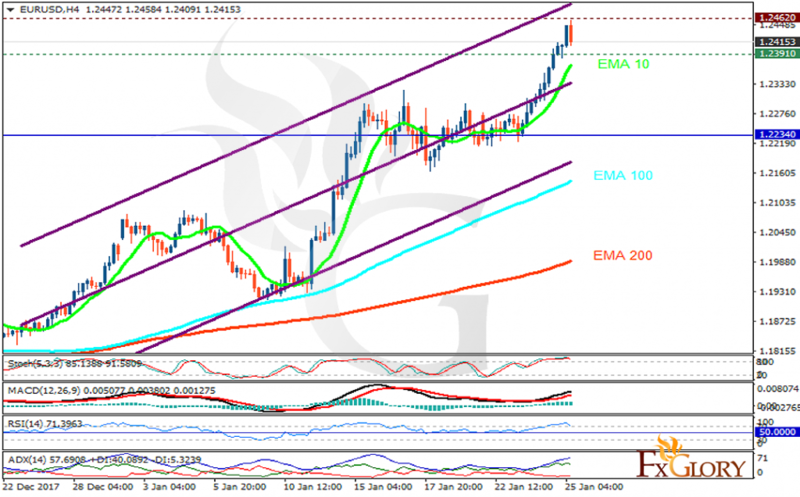 EURUSD will continue its bullish trend towards 1.25 however pullbacks will be observed with the support line of 1.23.